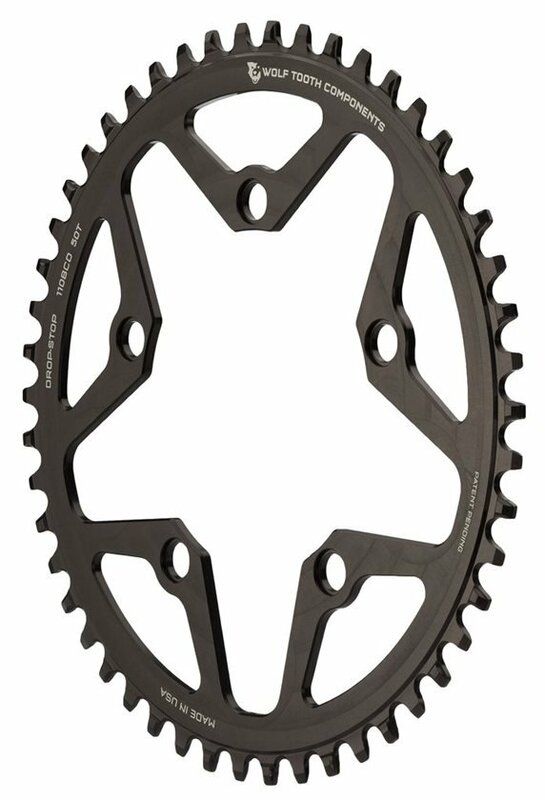 Wolf Tooth chainrings are made in the USA from 7075 aluminum and feature Wolf Tooth's signature Drop-Stop tooth design that is intended to resist chain drop when used with a 1x drivetrain. No more dropped chains and the pure simplicity of a 1x drivetrain is made possible with these well built, reliable rings. Convert your current set up or simply upgrade your existing 1x ring, you won't be disappointed. 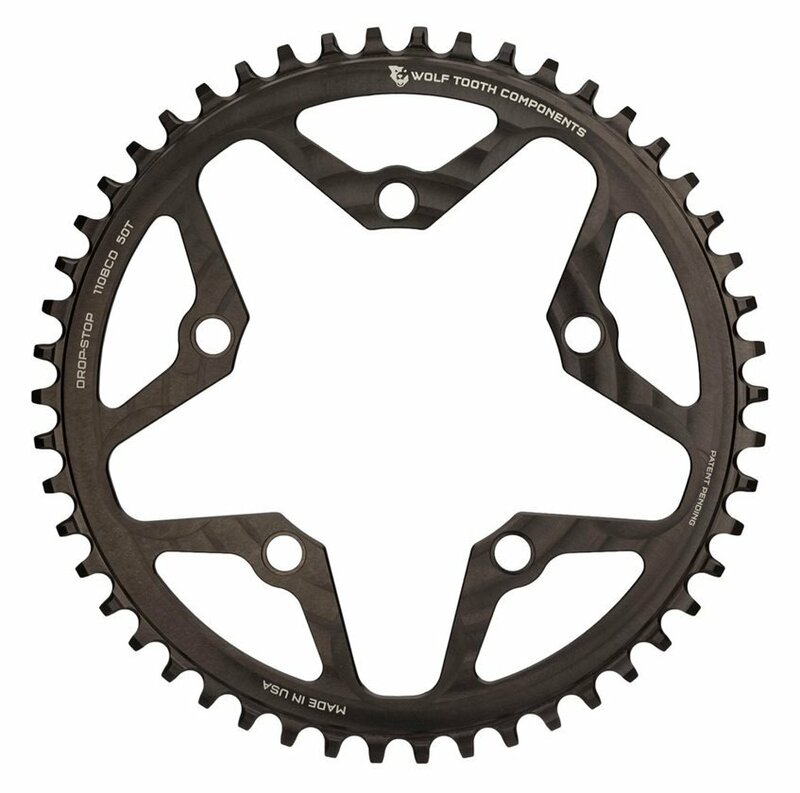 110 mm BCD chainrings to fit standard cranks with 5 bolt, 110 mm spiders. Does not fit Shimano DA 9000 / Ultegra 6800 cranksets. Strongly recommend a 10 or 11 speed chain. If using a 9 speed drivetrain, plan to use a 10 speed chain (it will shift fine), as the 9 speed chain fits too loosely on the ring. Note on mud (from Wolf Tooth): Wide/narrow chainrings do no work well in heavy mud (Wolf Tooth or any other brand) if you plan to ride in very muddy conditions, we recommend a chainguide or chainkeeper and clutch-type rear derailleur! Without these precautions, you may experience chaindrops and/or chainsuck. Simply the best. In a whole season of rough cyclocross racing and training I haven't dropped a chain... and I'm using a standard Force 22 derailleur (not a clutched one). Paired with the Wolf Tooth chainring bolts (also amazing) these rings look dashing and work amazingly. Machining and finish is top notch. 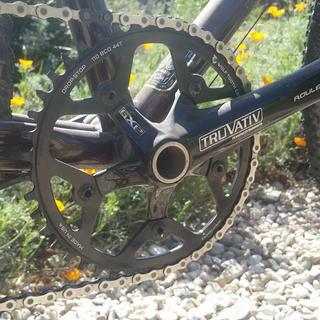 Upgraded my old drive train on my Surly Straggler to 1x10 and Wolf Tooth was the only one that made a 110 BCD 44T NW chain ring . Combined with my SRAM X9 derailluer, even after hitting some fairly technical descents, my chain never fell. I had originally mistakenly ordered a 130 BCD and had to reorder a 110 BCD. Jenson quickly processed the return and the new chain ring arrived within a few days. Fit and finish of the Wolf Tooth chain ring appear excellent and installed with no issues. Just about anything I've used from Wolf Tooth has impressed me and this ring is no exception. It looks great and never drops a chain! I installed this on my gravel bike and it has been money well spent. Now my bike will climb a wall with no worries of a dropped chain. Y love the Woldtooth components, they are a little bit expensive but worth it. The chain never drops off, and it looks really nice. Does this chainring come with the 1x specific chainring bolts? Nope, but you do get a little sticker, which is nice. No - it does not include chain ring bolts. No, you need to buy them. I plan on using this on my si crankset with 110bcd. However, I plan on setting it up as a 2x11, 50-34t front 11-28t cassette. Would it be an issue using an narrow wide chainring for a 2x setup? BEST ANSWER: As far as I know, you cannot use narrow wide rings except on a 1x drivetrain. The chains inner links must mesh with the narrow teeth and once the chain is derailed, there's no way to line up the chain on the appropriate teeth. The Wolftooth is created and designed to function as a single ring only. It has no engineered shifting ramps and or pins. I wouldnt recommend using it as a double. Not 100% sure as I am not an engineer or a rep but my opinion. This chainring can't be used with another chainring, the derrailleur won't work because of the long tooth. I don't think it would work. This chainring is designed specifically for a 1x setup. Will these fit on Shimano dura ace 7900 crank? BEST ANSWER: NO, it will not fit. Your crank set requires chain rings with 130 mm BCD. The Wolf Tooth chain ring is 110 mm BCD. If you have a 110 BCD crank than these will fit. Can I use this to replace my outer chainring for a SRAM Rival 22 drivetrain? BEST ANSWER: Most likely, yes. Assuming you mean that you will not be using a front derailleur (i.e. going 1x in front); you cannot use this in combination with another ring / with a front derailleur. With 1x, though, you can use this to replace the outer ring. If you are getting a smaller size, you could probably replace the inner ring too if that yielded better chainline for your setup. The teeth are not offset inboard on this ring as dramatically as they are on the SRAM X-Sync rings. So the chainline may be a couple mm more outboard than optimum, but in practice you probably won't notice unless you have short chainstays and a very large low-gear cog in back. 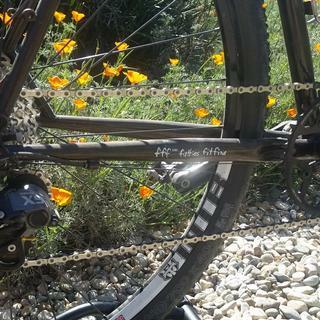 I used the 44t on the outside of my SRAM Rival 10sp crankset with a 135/142 rear hub spacing and 430mm chainstays with an 11-36t cassette and it worked perfectly. I replaced my two SRAM Red 22 chain rings with a single Wolf Tooth chain ring - and removed the front derailleur. I also had replace the chain ring bolts.